Location: Spanning the canal at a skewed angle, to south-east of Govilon. 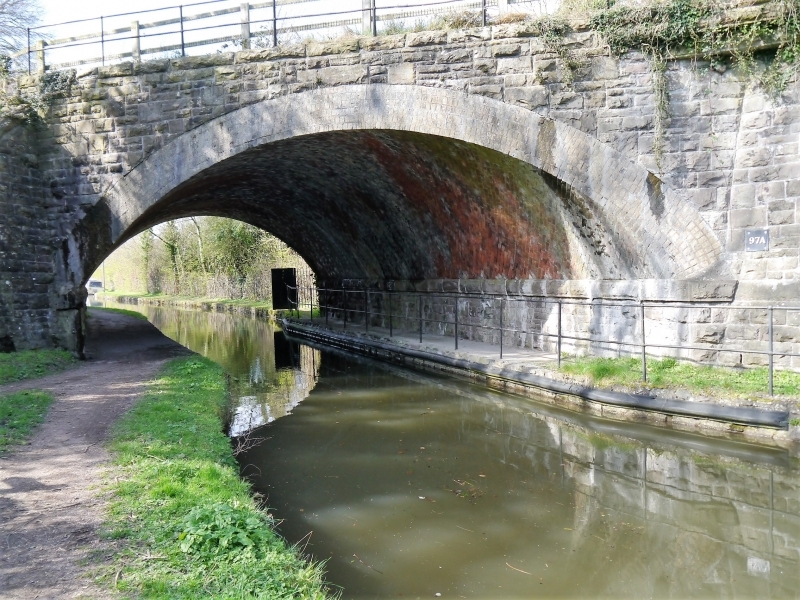 History: Built to carry the Merthyr, Tredegar and Abergavenny Railway line over the canal. The MT&AR was incorporated in 1859 and purchased Bailey's Tramroad which ran from Nantyglo Ironworks to Govilon Wharf. Before the first section was opened in September 1862 it was leased by the LNWR who were seeking to capitalise on the expanding heavy industry in the region. Construction of this railway line was judged to be a significant engineering feat as it had to climb the Clydach Gorge and the gradient was such that special locomotives had to be designed. The Brecknock and Abergavenny Canal (now known as the Monmouthshire and Brecon Canal) was constructed between 1797 and 1812. Gradually the railway took traffic off the canal and eventually it was bought out by the Great Western Railway. Description: Rock-faced rubble, single-arch, railway viaduct carrying the railway over the canal at a skewed angle. The soffit shows a clear break in construction two-thirds of the way along and differences in the voussoirs to the segmental arches on the west and east sides indicate that the bridge was widened at a later, probably late C19, date, to add an extra line to the track-bed. Furthermore, at the straight joint vestiges can be seen of the yellow brick voussoirs of the original western arch. The east (Llanfoist) side has flush yellow brick voussoirs while the west (Govilon) side has blue brick voussoirs laid in a toothed manner in five oversailing courses. The soffit is red brick over a rock-faced rubble with a band course between. Angled rubble abutments to both sides. Iron parapet rails retained to east side but modern timber parapet to west. Tow-path to south side of canal and further path to north. Listed for its special interest as a good example of a C19 skew-arch railway bridge and for group value with the listed canal structures at Govilon. References: D D & J M Gladwin, The Canals of the Welsh Valleys and their Tramroads, (Oakwood Press, 1991), p. 11-16. H Morgan, South Wales Branch Lines, (1984), p54-60. Set back on the north side of the canal between the railway viaduct and Govilon Yard bridge. The principal building at Govilon Wharf, now the British Waterways Board Office. Between Canal Warehouse at Govilon Wharf and Govilon Yard Bridge. .